The soft baggy baby pants or shorts are super comfortable and offer plenty of agility for kicking and romping. The pants grow one size, as the waistband and cuffs can be turned over at the beginning. 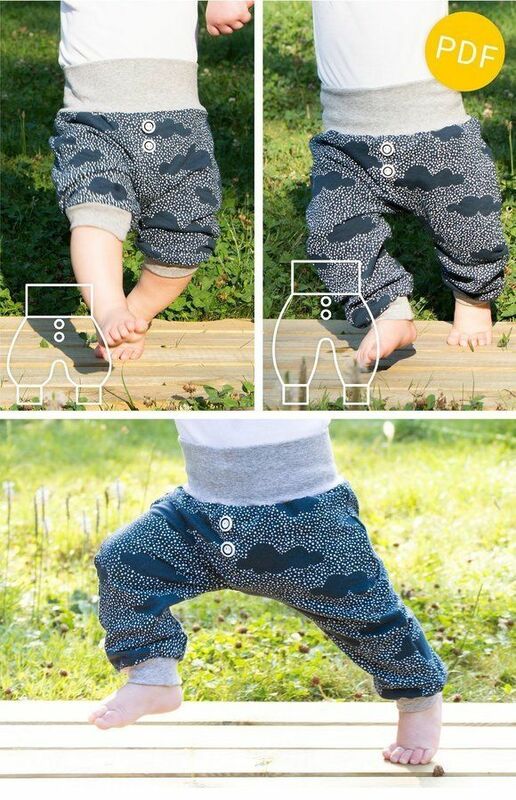 Sewing pattern and sewing instruction for baggy baby pants and shorts are included. Sizes for children from one month to three years. The shorts end just below the knee, so that the knees are protected when crawling. Sewing pattern is great for pattern fabrics, as there is no seam at the front and back. The pants are sewn quickly and are also suitable for sewing beginners. Oma Ella's sewing instructions explain sewing step by step with many pictures. For the pants: Jersey fabric or sweatshirt fabric, dimensions 32"/21"
For waistband and cuffs: rib knit, dimensions 28"/8"